The Tamiami Trail is more than a one-mile bridge. The Big Cypress Nat'l Preserve portion has 49 little bridges on it, each 25 to 300 feet wide, which are more or less evenly dispersed over a span of thirty five miles. 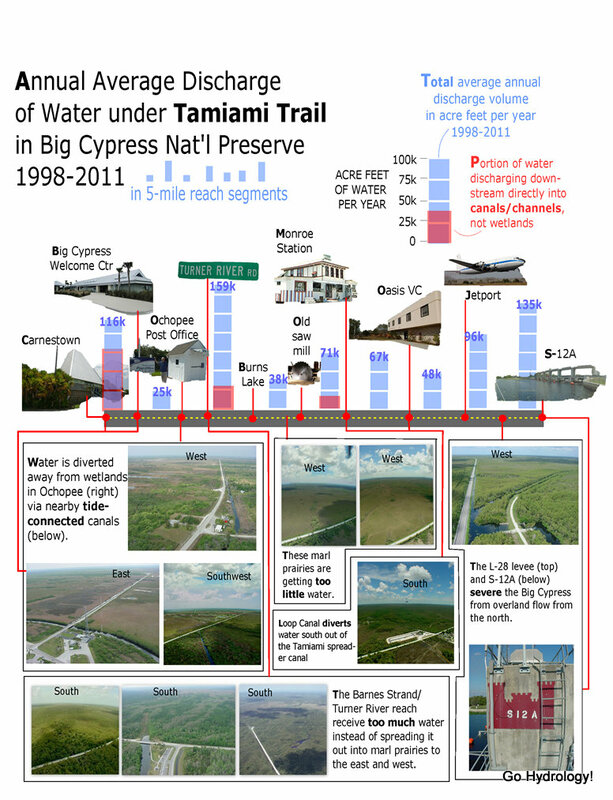 The bar chart above displays annual-average discharge of freshwater under five-mile segments of the thirty-five miles length of the Tamiami Trail in Big Cypress Nat'l Preserve, as calculated from 1998 to 2011. The blue portion of each bar reports total annual freshwater flow whereas the red-coded bar indicates the portion of the total which discharged directly downstream into canals or channels. The latter is highly undesirable in instances where those canals are deep and directly connected to tide (because instead of storing the freshwater in wetlands for the coming dry season months we are wasting the water to tide in a matter of hours and days). The photographs on the bottom are intended to help visualize the information on the graph, but you may have to click the image to enlarge to see best. The source of this discharge data is USGS and ENP and the chart was created by BCNP. The hydrologic misfortune is their uneven distribution of flow (see figure above). On the one hand there's the reach near Turner River Road and Barnes Strand which is seemingly bountifully fed, but that abundance comes at the expense of sending too little water to the marl prairies to the east and west. The biggest problem area of all is where the bar charts show big proportions of red. That's a sign that water is being sent directly into canals/channels on the downstream tailwater side of the bridges instead of into wetlands (as sheet flow) where it belongs. The solution in short calls for severing all tidal connections and re-plumbing the upstream road and canal infrastructure to replenish water into wetlands instead. That will not only resuscitate a seasonally-sustained sheet flow regime back into the swamp, but also guarantee a vital slow-feed of freshwater into the downstream vital estuaries, too. Healthy estuaries start in the swamp (song).